At the age of 15, Rose realised her life was going to be very different to the dreams she once held for her future. She would not live the fairytale life she had imagined. Instead, she would find herself living in a nightmare of broken promises with no apparent way out. But in her deep love for her children she would find the strength, determination and courage to go on, to push forward, if only for them. Australia is a big, diverse country and Rose experienced many emotions moving around this dynamic landscape more often than she liked. Finding out her mother’s secret, and then losing her mother, threw her life into turmoil. To discover more and find the answers to the many questions she had, she would have to leave her quiet little village on the mid north coast of New South Wales and travel alone to Italy. Separated by time and secrets, would strangers finally find each other? And just how long is the road to happiness? Marianne Delaforce is an adventurous, brave, take-no-prisoners kind of woman with a big heart. Marianne grew up on a dairy farm at Telegraph Point, NSW. She has raised two sons and has two small grandchildren. Marianne will have a go at anything if it interests her and believes if you’re not happy and don’t like what you’re doing, don’t whinge about it, change it! She can drive a road train, ride a motorbike, likes skydiving and bungy jumping. singing and entertaining. She currently works as a marriage celebrant, produces videos and sings. She sold her company and restaurant three years ago, packed up and took off on the adventure of a lifetime to find herself again on the “Free, Fabulous and 50 Tour”. Marianne has travelled Australia with her trusty blue heeler dog, Elly, by her side. Towing an off-road caravan with her Land Rover, they have made their way around Australia twice in that time, through the Gulf of Carpentaria, up to Cape York, across the Nullarbor, and have traversed both The Gibb River Road and The Outback Way, Australia’s longest shortcut. 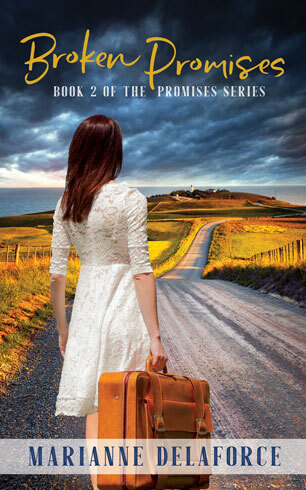 The Promised Land – Great story Marianne, couldn’t put the book down. I did have trouble reading at times through the tears. Looking forward to book 2. I loved getting lost in this story. Makes it all the more amazing knowing the characters are real. Thanks to Marianne for sharing this book. Life happens and the strong make the best of a situation which Loretta certainly did. I cant wait to read the next book and find out what happens to Rose! I really enjoyed this read, I loved the honest, no nonsense way it was written, like a friend telling you a story. The story had me intrigued and I became totally involved, I cried and smiled – Loved it. Can’t wait for the next one, I need to see what happens next.